A customized, brandable iOS and Android VR/360° video app to help BC Lions fans get in the game! The BC Lions have been a part of the Canadian Football League (CFL) since 1954 and they have built a large and enthusiastic fan base located all across Canada. When fans are scattered across the country and cannot regularly attend live football games at BC Place stadium in Vancouver, it can be difficult to keep them actively engaged. 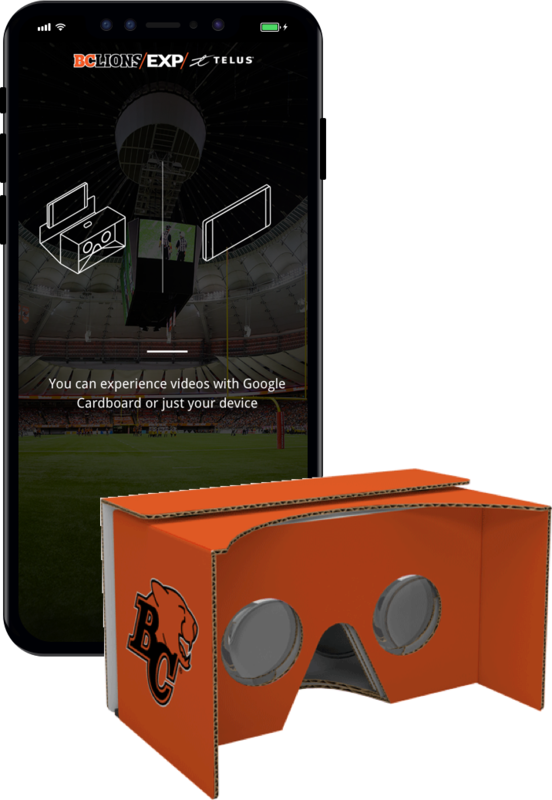 Most sports apps typically feature scores, stats and highlights, however the BC Lions wanted to create a relevant, fun and innovative app that featured exclusive Virtual Reality 360-degree (VR/360°) to enhance the live game experience. They also wanted to allow select partners to sponsor content, which would provide an opportunity for ROI. The BC Lions turned to Radical I/O to help them create a user-friendly platform that would allow them to quickly share VR/360° content from the live games, and behind the scenes, with their fans. The team at Radical I/O knew that the BC Lions needed an accessible platform that allowed for quick upload of near-live VR/360° content, direct from the game, and manage content between games. As we designed and developed the mobile app using our BETHERE360 platform, we also listened to the BC Lions’ unique needs and created the concept of “rapid replay” - allowing fans to experience near-live content. We developed a backend upload and media management tool that would enable the app to deliver this rapid replay concept. We partnered with Perspective Films to identify exciting and immersive behind-the-scenes content that would bring BC Lions fans right into the action. 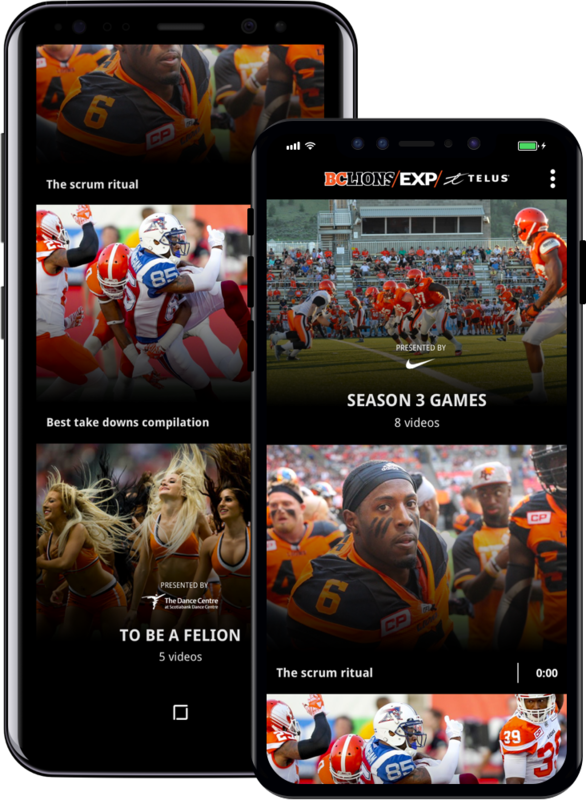 The new BC Lions EXP app for iOS and Android launched September 2017, becoming an instant hit, and allowing BC Lions fans to experience a whole new level of engagement. With one tap, fans can download the BC Lions EXP app from the iTunes App Store or Google Play for free. The native iOS and Android mobile apps have a video player that allows viewing of VR/360° video directly on a smartphone, with or without a headset. Fans also have the option to download videos to watch their favourite huddles and touchdowns again and again, without a network connection. BC Lions EXP gives fans the same excitement of being at a game along with unprecedented behind-the-scenes access - from the locker room to the huddle, and on the playing field. By creating their own app, the BC Lions can control advertising and sponsorship opportunities, and provide a branded experience, using their own colours and logos. The app has sponsorship capabilities, including Title Sponsor, with a logo on the main entry screen and headers throughout; and through logos on the videos and video descriptions. Radical I/O is able to track the success and impact of the BC Lions EXP app for iOS and Android, providing user metrics (downloads, gender, age groups, locations), app usage statistics, and video engagement. The team at Radical I/O is proud to have partnered with the BC Lions to create and host an innovative and immersive VR/360° fan experience via the BC Lions EXP app. We are a different kind of technology company. We care about communities, relationships and social good. We work with nonprofits, community-focused organizations, government and ethical enterprises to build good technology that makes a difference. Our in-house team of engineers, designers and strategists are committed to delivering excellent outcomes, and exceeding our client’s expectations. The BC Lions are a professional Canadian football team in the West Division of the Canadian Football League. They are based in Vancouver, British Columbia, and play their home games at BC Place. Working with Radical I/O was a pleasure. The team knew exactly where we wanted to go and how to get there. They even built a custom "rapid replay" feature for us. The result is BC Lions EXP, one of the most innovative and exciting sports apps in North America.